On Wednesday, Dylan stayed home from school. He had a relaxing day while I ran his siblings to and from school, and ran errands. Finally, Lexie and Lily came home from school, super excited about Thanksgiving, and the 5 day break! When Grant left the office, he gave us a call so we could meet him for Dylan's birthday dinner. We usually let our kids choose a restaurant ON their actual birthday, but because his birthday fell on Thanksgiving this year, he opted to go the day before. He chose Cracker Barrel this year, and everyone was happy with his birthday dinner choice! After a delicious dinner, Dylan and Lily headed home with Grant, while Lexie, Liam, and I ran some last minute birthday errands. We had to pick up a few more gifts, and buy donuts and cake baking supplies. When we got home, we gave Dylan an early birthday present - one of the video games he really wanted - and let him run off to play his new game. By that point, my morning sickness kicked in something fierce, and I ended up in the bathroom for over an hour. I decided going to bed was my best bet! On Thanksgiving morning, the girls and Grant woke up early to watch the Macy's Thanksgiving Parade. Dylan, Liam, and I joined them a few minutes after the parade started. The birthday boy woke up happy! He spotted his new birthday outfit hanging on his closet door, and all the balloons that filled his room, and was ready to celebrate, even though he was sleepy from staying up late playing his new game! We kicked off his day with our traditonal birthday donuts breakfast! As we sang "Happy Birthday" to him, I couldn't help but feel nostalgic. It's so hard to believe that our first baby is FOURTEEN! By that point, it was time to get ready for Thanksgiving dinner! I had to make sweet potato casserole, green bean casserole, and a birthday cake, so I recruited Lexie to help me in the kitchen. She was a BIG help, and we got done with our cooking and baking quickly! We all got dressed for Thanksgiving Dinner, and made the one mile trek down the road to my sister's house. The crowd was very small this year. It was just our family, my parents, my sister, my brother-in-law, and my brother-in-law's mother. My niece and her family moved to Georgia in May, and this was the first Thanksgiving without them in years. I'm not going to lie...it was a bummer for all of us! We made the most of it, though! Dinner was delicious (and I kept what I ate down), the company was great, and we laughed a lot. The girls Face-timed for over an hour with their cousin in Georgia, and we also Face-timed with my nephew and his kids in Florida. We ended our Thanksgiving meal with cake for Dylan! Grant took Dylan home early so he could relax and enjoy his birthday gifts, while the rest of our family stayed behind to visit some more. Eventually, everyone started to get tired, and we all headed home. We decided not to visit anyone else like we typically do. Instead, we changed into our pajamas, and had a relaxing evening at home! Not only was it Dylan's birthday AND Thanksgiving, but I also reached 24 weeks of pregnancy with our baby boy! Dylan and his baby brother will be over 14 years apart in age. It's hard to believe that Dylan will graduate high school before this baby even starts Kindergarten!!! I'm still in disbelief that we're adding another child to our family! Next year, there will be one more person in this picture! Although it wasn't our usual kind of Thanksgiving, we had a nice day! Most important, Dylan had a great birthday. I may not have taken many pictures, and we may have skipped our usual holiday traditions, but we spent the day together as a family and made lasting memories! 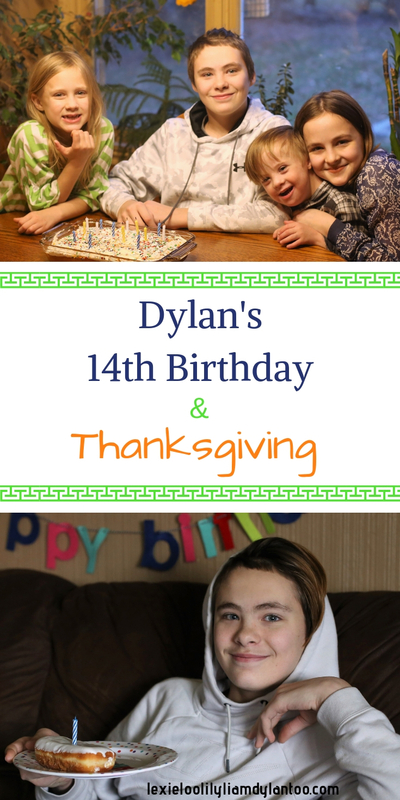 Happy 14th Birthday, Dylan! We love you SO much! I am sure having a Thanksgiving Day birthday has it's drawbacks but it's kind of fun to me since it gives the holiday a bit more to celebrate. Happy birthday! Looks like a great day. The cracking up laughing picture is so cute! Ok how is he 14? That is sooo crazy!!! 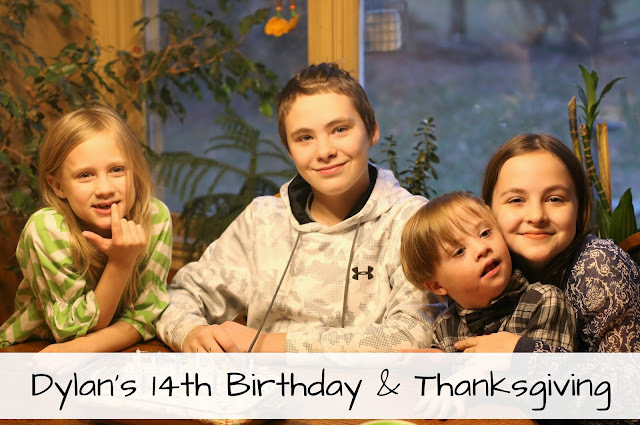 So glad he had a great birthday and you all had a wonderful Thanksgiving! Wow, I can't believe Dylan is 14! The years are just flying by. I love that he chose to have his birthday dinner at Cracker Barrel--it's one of our favorite restaurants. Lewie's into playing games like Fortnite on xbox, too. It sounds like you all had the perfect Thanksgiving and birthday celebration (minus your morning sickness). This must be such an exciting time for everyone. I always enjoy seeing pictures of your sweet family.